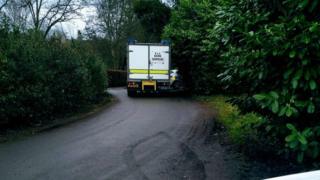 A road has been closed after a "suspected unexploded tank round" was found in the woods. Officers said a bomb disposal team from the Royal Logistic Corps had arrived to "assess the item" at about 15:00. An officer tweeted: "No need to worry...just avoid the area and if concerned approach an officer." Earlier police said they suspected the round was part of an old collection that someone had discarded. The force has provided no further details at this time.